Getting Through the STORM SEASON–Review and Giveaway! Hi there! I’m so excited to welcome Pene Henson over to chat about her new book, a lesbian romance, set in Australia’s wild mountains and bustling Sydney. STORM SEASON features a trendy culture blogger finding a soul connection with a ranger with a colorful past. I really liked INTO THE BLUE, so I thought I’d give this one a try. Check out the author interview, and be sure to scroll down and get in on the $25 GC + books giveaway. The great outdoors isn’t so great for Sydney It-Girl Lien Hong. It’s too dark, too quiet, and there are spiders in the toilet of the cabin she is sharing with friends on the way to a New South Wales music festival. To make matters worse, she’s been separated from her companions and taken a bad fall. With a storm approaching, her rescue comes in the form of a striking wilderness ranger named Claudia Sokolov, whose isolated cabin, soulful voice and collection of guitars belie a complicated history. While they wait out the weather, the women find an undeniable connection—one that puts them both on new trajectories that last long after the storm has cleared. 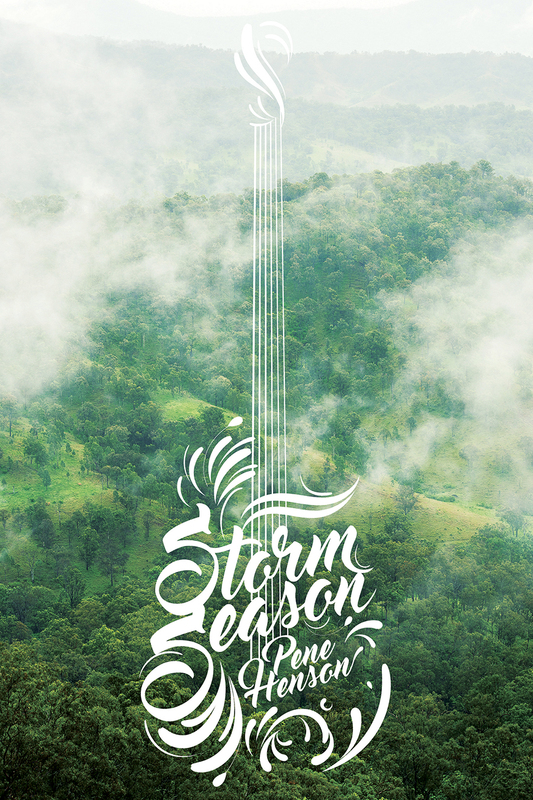 Today I’m very lucky to be interviewing Pene Henson author of Storm Season. Hi Pene, thank you for agreeing to this interview. Tell us a little about yourself, your background, and your current book. I’m Australian, extroverted and hard to ruffle. Also I’m pretty tall, mostly lacking in sporting prowess, and way less funny than I’d like to be. I live with my wife and our two divinely awesome kids in Sydney, along with a ferociously loving cat. I grew up dreaming of being an astronaut or an experimental physicist. I love sciences and mechanics but I’d do a dreadful job of either of those things so fortunately I surprised myself by developing a career in law and writing. I’ve always written poetry and short fiction. I never really dreamed of a novel until I was writing one. It was delightful to build a whole world, the first in Hawaii and on the ocean, and fall in love with my own characters. Storm Season is my second novel. It’s set on the Australian East Coast, in land and in cities that I know well. Like my previous novel, it’s essentially a happy queer story. It’s a romance between a bubbly and adorable fashion blogger and a capable park ranger living alone in a remote cabin. As you’d imagine, these women have vastly different experiences. They think they have vastly different priorities. Trapped together by a storm, however, they uncover not just a deep attraction to one another but also all the ways they fit together. And then, of course, the storm breaks and they have to work out what will happen when they return to their ordinary lives. Is there a character in your books that you can’t stand? (Antagonist for example) And what makes them someone you don’t like? My books don’t tend to have antagonists. Because I’m writing pretty low-angst romance, the characters just don’t come out that way the same way my life might have irritations but not antagonists. In this book, Claudie’s ex girlfriend Dani is pretty hard to like. She hurt Claudie; she is self-centred and thoughtless and controlling and still doesn’t recognize the wrong she did. But she is also charismatic and generous in her way. She believes she’s helping queer women reach for something; she thinks fame matters and she wants to see people achieve their best. She’s not someone I’d want to be in a relationship with but she is parts of people I have known and those people have their redeeming qualities. Are there misconceptions people have about your genre? I don’t think it’s a misconception to believe that romance can be formulaic, that the power balance between women and men can be wrong, that sometimes you can anticipate plot points and misunderstandings and that characterization can be weak. But the same can be said for action books, mysteries, high fantasy, literary fiction. I have two answers to that. Sometimes formulae are enjoyable. Sometimes you want to read something where you know the ending the first time you see the characters names on the page. Whether it’s a mystery or a spy novel or a romance. The best of any kind of book brings you something new. Perhaps it reaches deeper into characterization, is careful with how it handles humanity. Perhaps it surprises you. Perhaps you see something in its ethics or its leads or the way they describe the scenery. Romance has plenty of talented authors and plenty of strong books. Find the ones that work for you. There are a couple of messages *blush*. Both of them are things I’ve come back to in both novels, and will come back to again. Love is wonderful. It’s life changing. It can be many things. But it’s not everything. In both of my books it was critical to me that the protagonists had something else going on. I wanted them to have big goals and friends and family. I wanted them to be strong without a partner, but delighted by love. In Storm Season, Lien has an extraordinary life with a queer family she loves. She has influence in her fashion and music blogging. She has excellent taste. She spends time in the novel developing some deeper opinion pieces, learning to take risks with her writing. With or without Claudie, and some of it is inspired by Claudie, she comes through as someone learning to be the best they can be. Similarly, while Lien makes it easier for Claudie to use her talents and rebuild her indie rock career, Claudie would be okay by herself. She’s still who she is, she’s happy with her life. Lien’s a bit of a catalyst for change, but she’s not the change herself. Being in a new place that’s out of your comfort zone can change you in ways you did not anticipate. Whether that’s lost in the bush without Internet access or connecting with a stranger in the cabin you wanted to live in alone, big changes force you to recognize what’s really important to you. And also sometimes give you an openness to falling in love. Don’t be afraid of Australia. We might have spiders, snakes and bats but we also have striking wilderness rangers who know their way around. “Come out here,” calls Claudie from the deck. It’s dark; there’s nothing out there. The world smells rich and wet. Lien holds herself still and looks out with the cabin lights behind her. “Wait a sec,” says Claudie. She steps back toward the house and reaches inside the cabin door. Everything goes dark. “Hey—” Lien can’t see a thing. They haven’t had lights in days, and now Claudie’s turning them off. The blackness seems complete. “You’re okay,” says Claudie. “It’ll take a moment for your eyes to adjust. I figured—It’s been raining so much. You haven’t had a clear night up here. I wanted to show you.” She moves beside Lien against the railing. And as Lien’s eyes accustom themselves to the dark, the sky opens up above them. The Milky Way sweeps a path of light across the great black bowl. Around that the night extends from one clear horizon to the other, lit by a thousand layers of stars on stars, dazzling bright in the dark. The universe goes on forever. It’s huge, and Lien’s tiny and breathless in front of it. In that moment nothing is worth thinking about beyond that sky, nothing but the huge universe and Claudie’s hand, steady and close beside Lien’s on the railing, Claudie’s warm body so near. Lien twines her pinkie around Claudie’s. They stand under the stars, still and silent. When Lien turns, Claudie’s cheekbones are traced in blue-white and her eyes reflect a thousand pinprick lights. She’s beautiful. She’s from a whole other world. Lien is a fashion and entertainment blogger in Sydney off on a camping adventure with her collection of friends before they his a week-long music festival. She’s not a camping gal, actually–this trip was the idea of her best friend and housemate, Beau, a transman who fancies Lien’s other great friend, Annie. Lien’s been casually dating Nic, but it’s not serious on Lien’s side. She’s just not sure about settling down. Camping is meant to be rough, but Lien and her friends have no idea what’s about to hit them. The forecast is for rain, but it’s nearly a monsoon. Lien is out hiking and takes a fall, just before the rain starts. It’s dark, and the only person who finds her is the park ranger, Claudie, who lives in the park in a cozy shack. Lien’s knee is too injured to allow her to hike back to camp, so Claudie brings Lien to her own cabin–and it’s a situation of stranded together. THe rain is so fierce over the next several days that Lien’s friends are forced to leave the park and take refuge in a nearby town, meanwhile Lien’s still to hobbled to make herself useful. Plus, Claudie’s grown accustomed to the solitary life, now that she’d given up on her soured rock-n-roll dreams. The more time Lien and Claudie spend, the closer they grow–sharing secrets, stories and eventually Claudie’s double bed. It’s all platonic at first, but, yeah, they start to fall for one another. Thing is, Claudie’s been burned by a woman before, Dani–her first love–and that’s a lot of why she’s pulled herself out of society and taken a ranger position. Connecting with Lien isn’t her plan–and it’s hard for her when that happens because Lien’s only supposed to be there for a week. Whiling away the hours with no exit and no power, Claudie plays guitar to entertain Lien. The rapport they build is hard for Lien to leave behind, too. So much so that when she must go, she seeks out a way to bring Claudie with her–hunting out her early recordings and sending it to Claudie with encouraging notes about her music and how she might fashion herself a new career. This is a sweet and quiet romance, and I liked the slow build. The isolation was an interesting part of the book–with it being a shelter, at first for both Claudie and Lien, but then becoming less so–as they find themselves feeling the pain of separation. And, the love of a good woman will drive many to make life-changing decisions. Including Claudie. Including Lien. Interested? You can find STORM SEASON on Goodreads, Interlude Press, Amazon, Barnes & Noble, iBooks, Kobo, Smashwords, Book Depository, and IndieBound. Click on this Rafflecopter giveaway link for your chance to win a $25 Interlude Press Gift Card or one of FIVE first prizes of an e-copy of ‘Storm Season’ by Pene Henson. Pene Henson has gone from British boarding schools to New York City law firms. She now lives in Sydney, Australia, where she is an intellectual property lawyer and published poet who is deeply immersed in the city’s LGBTQIA community. She spends her spare time enjoying the outdoors and gazing at the ocean with her gorgeous wife and two unexpectedly exceptional sons. Storm Season is her second novel. Thank you for this lovely visit! I love how you saw the book and enjoyed talking about romance and themes. My pleasure! It was an interesting read, for sure!